With all the choices out there when it comes to humidifiers, diffusers, and the multifunctional diffuser and humidifier in one, it can be tricky to figure out which one to buy. Whether you’re looking into adding moisture to the air in your home, or you want a diffuser for your essential oils, the best diffuser-humidifier can please everyone. Some people who just want the benefits of the oils might prefer a diffuser only, as they’re more likely to get higher concentrations of the oil particles in the air. That doesn’t mean that these combo units aren’t effective, though. Learn more about these multifunctional machines that can help ease the symptoms of an arid climate, freshen a room, and even provide you benefits you didn’t know about. 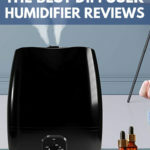 Be sure to read diffuser-humidifier reviews, too, so you can pick the right one for you. Why Aren’t All Humidifiers Diffusers and Vice Versa?